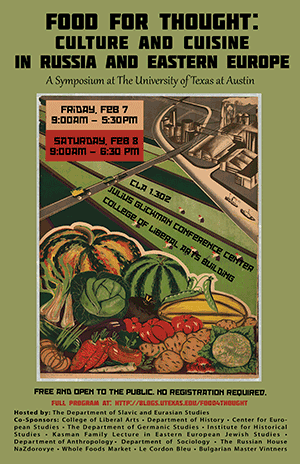 About a month ago I got wind of a conference called Food for Thought: Culture and Cuisine in Russia & Eastern Europe, 1800-present, at the University of Texas at Austin. In some dream world, I would have booked a flight there and then, packed my audio gear, and plunged in. Next best thing, thanks to the kind offices of Rachel Laudan, was to talk to Mary C. Neuburger, the conference organiser. It isn’t clear whether the symposium will give rise to a publication. I hope so. And if, by chance, any of the authors have made versions of their talks available, I would be delighted to link to them here. Just let me know. Other sources include The Austin Chronicle, which took the opportunity to visit and review a local Russian restaurant. And Mary Neuburger also mentioned Anya von Bremzen’s memoir Mastering the Art of Soviet Cooking: A Memoir of Food and Longing. That, I hope, is another story for another time, preferably not in a dream world.